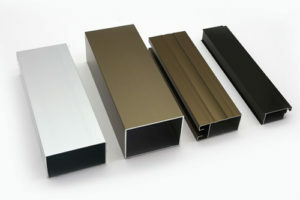 Aluminum profiles are produced by pushing aluminum billets through a metal die to get the standard or custom shapes. We can produce extruded profiles with the weight per meter ranging from 0.10 Kg up to 50 Kg, the largest circle size is up to 650mm. With in-house surface finish processing capabilities, all of our aluminum profiles can be produced in mill finish, anodized or powder coated in desired colors. After extruding, these aluminum profiles are precisely cut to required lengths and then sent to packaging for shipment. Our warehouse members would find a proper packaging for the profiles to protect the materials during shipping. As regard to the extrusions which need to be fabricated, they are sent to our fabrication shop for further processing. Extruding aluminum is our specialty, we try to help our clients build their products from start to finish. To ensure the right alloy and profile shape design is selected, our engineer team is able to help our clients design their aluminum profiles from the early stages when it is necessary. An excellent design on aluminum shape will lead to cost effective product and constant good quality. Contact us when you are looking for a powerful manufacturer to produce the aluminum profiles.